So many of us tweet random thoughts, links and photos throughout the day, yet there’s no surefire way to export all of our pointless musings or even properly search through the crazy things we’ve been ranting about since we first signed up to the highly addictive service. 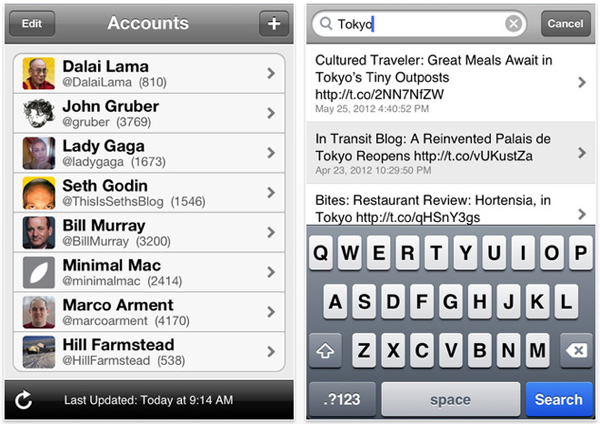 Well enter a new iOS app called Tweet Keeper, which gives you a lot more control over your Twitter data. Once you’ve downloaded the app you add in a username and it’ll start collecting together old tweets, before presenting them in a list and allowing you to search through them and even export them all as a spreadsheet or plain text file if you’re that interested in what you’ve been saying. Unfortunately Twitter only provides access to your last 3,200 updates but for most users that’s probably a big chunk of everything they’ve been saying. If you’re a serial Twitter user like me you’d probably rather not rewind any further back to see the silly things you were moaning about well over a year ago anyway. Once you’ve set up an archive for your tweets all future updates will be sent there too and interestingly you can set up seven more archives. The app page on iTunes suggests that you use that space to stay up to date with other interesting Twitter users, but we really know that it’ll be a useful tool for super social media stalkers who need a crazy and reliable way to keep tabs on certain people ALL OF THE TIME. You’ll have to pay £1.49 for the Tweet Keeper app, but it actually provides a very handy service so if you want to permanently save your tweets and really care about keeping your old content safe, then it’s well worth it. Available from iTunes for £1.49.